A non-destructive way to restore the oldest commercially available photographs in the world, daguerreotypes, to their former glory has been developed by researchers at Western University, creating a new scientific process and giving a fresh glimpse into the past. Creating daguerreotypes involved using a polished slab of silver-coated copper approximately 7.5cm wide and exposing it to heated mercury vapour. The subject of the photography had to sit perfectly still for around three minutes, until the process caused an imprint to emerge on the surface of the silver. Researchers at Western University Canada, led by Madalena Kozachuk, were given two daguerreotypes by the National Gallery of Canada, which to the naked eye were not even recognisable as having a photographic image impressed upon them. Kozachuk and her team the developed a system of using rapid-scanning micro-X-ray fluorescence imaging to identify how the mercury was spread over the silver. Each daguerreotype has a slightly different composition, making the process of restoring the image hidden within each plate slightly different each time. The researchers used a synchrotron-based research facility, the Canadian Light Source in Saskatoon, to discover the unique properties of individual daguerreotypes. 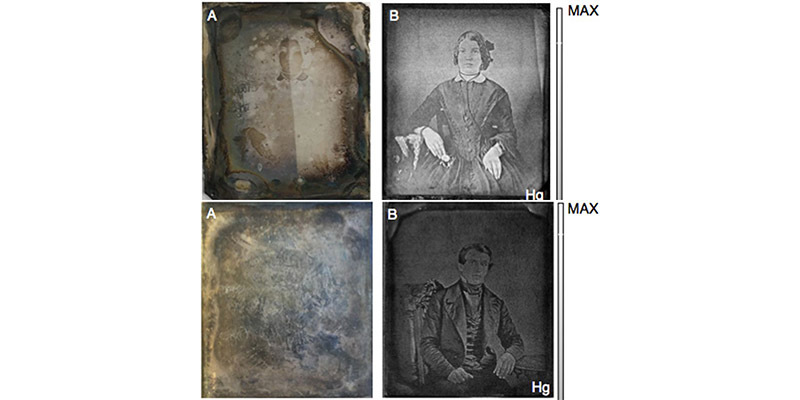 Using a synchrotron provides an accurate and detailed chemical layout of the daguerreotype, and closer analysis can reveal how the chemicals are bonded to the metal, which sheds light on what new methods of restoration could be developed. This method also has the perk of being non-invasive and posing little to no threat to the daguerreotypes, which is important because every daguerreotype is the only one of its kind, each photograph having only been taken once. Each daguerreotype took around eight hours to scan with an X-ray beam was as small as 10x10μm and used the energy most sensitive to mercury absorption. This new process is capable of both helping to restore the lost images on daguerreotypes and recreating the image that was there if restoration is not possible. The recovery of these images and potential to restore thousands more daguerreotypes is not only demonstrative of a clever new scientific process, but also giving the historical community a new insight into the lives of people who lives almost two hundred years ago, making them the oldest images that do not take any artistic licence when depicting the subject. Kozachuk and her team are continuing to refine their process and restore daguerreotypes in collaboration with the National Gallery of Canada. My teacher is a robot!